00:30:00 Makes 6 servings, 1 "steak" (256 g) each. Makes 6 servings, 1 "steak" (256 g) each. You will be amazed that something so simple can taste so great. Mix first 5 ingredients; shape into 6 (3/4-inch-thick) patties. Heat oil in large skillet on medium-high heat. Add patties; cook 5 min. on each side or until done (160ºF). Meanwhile, mix gravy and sour cream. Pour gravy over meat. Bring to boil; cover. Simmer on low heat 5 min. 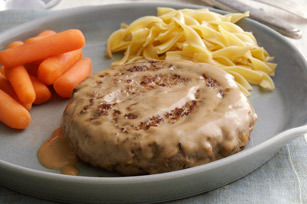 Add 1 can (10 fl oz/284 mL) drained sliced mushrooms to gravy before pouring over cooked meat. Serving Size Makes 6 servings, 1 "steak" (256 g) each.